Materials: drawing with parts of the beef, questionnaires, list of the parts of meat and ways of cooking. Participants: Everybody exchanges knowledge and experience based on Panayiotis’ presentation. · Which are the characteristics of pork meat? 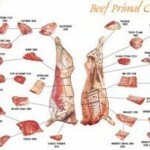 · What are its differences when comparing beef and lamb? · Which is considered to be better for eating? · Which part of the meat is suggested for soup, which for stew, etc? · In which way meat accompanies our habits? · What is its symbolism? Why? · What kind of meat is preferred at instances related to religion? · Which are the reasons for several religious prohibitions related to the consumption of meat? · What symbolizes pork meat for Muslims and what beef for Buddhists? · Modern life style and consumption of meat: Vegetarians and substitutes. Dioxins-related illnesses. · The animal’s diet and its aftermath on the product destined to the market. · The Mediterranean Diet . · Where could somebody learn to cut meat properly? Authentication / Certification. Peer mentoring constitutes a pleasant and creative way of sharing and appropriating knowledge. Panayiotis, as a butcher, is thoroughly aware of the parts of the meat and the suggested ways of cooking. Mrs. Soula as well knows the parts of meat very well, since, before her retirement, she was keeping a butcher shop with her husband. They both presented us the parts of meat and ways of cooking them, using the peer mentoring method. We have learnt which parts are best for yiouvetsi (typical greek recipe) and which are for stew. 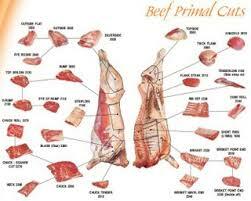 We have learnt to distinguish and choose the right meat, according to our appetite and to what can we afford. For instance, Panayiotis explained that the filet is the best part of meat, because it comes from a part of the animal which is not used for vital functions, so it doesn’t contain fibers or fat. We have been informed that it is preferred to be eaten ‘medium’ and that it is a particularly favorite choice of the ksenoi (foreigner visitors). Nevertheless, the one “who knows” prefers the cheeks or the oxtail for a good and nutritious yiouvetsi. The trainees showed a vivid interest, while their instructors were even more enthusiastic, deciding to choose from then on the meat they are buying. The discussion that came on was about quality and about distinguishing fresh from stale and domestic from imported meat, which something the trainees showed active interest for. Unfortunately, it’s not easy to tell, but a quite secure indication is how hard or tender the meat is. Domestic meat is usually harder, because the animals are in free range, in contrast to the way that animals in farms are fed. At this point we have also been informed that farm animals are being tortured, not having the possibility to move, in order to gather more fat by not losing weight. Going on with our discussion, we talked about authentication /certification, ending up though to the conclusion that experience is what establishes you in each profession. Summing up, we have concluded that meat is a vital element not only of people’s diet but of its culture as well. It is related to religious ceremonies and accompanies significant passing rituals. In this context Mrs. Soula has explained how kiskets is made, using all parts of the animal and Antonetta has shared with us her experience from a ramazan celebration. This has turned out to be a very pleasant and educative experience for all, so we have all committed ourselves to repeat it.